Steve and Seren Sinisi raise hundreds of hogs, cows and chickens, as well as vegetables. At the height of the growing season, Steve and Seren Sinisi are “straight out” in managing Old Crow Ranch, on Davis Road in Durham. Steve Sinisi is a one-man crew on the 65 working acres, raising hundreds of hogs, cows and chickens, as well as vegetables. Seren Sinisi, who doubles as a stage hand in Portland, manages the finances, and helps her husband out as time allows. There’s not much room for leisure activities, but the Sinisis are getting it done in terms of finding markets for their animals and produce. All of Old Crow Ranch’s animals are “pasture based” – they live outside, and have free reign to forage on the farms grasslands. 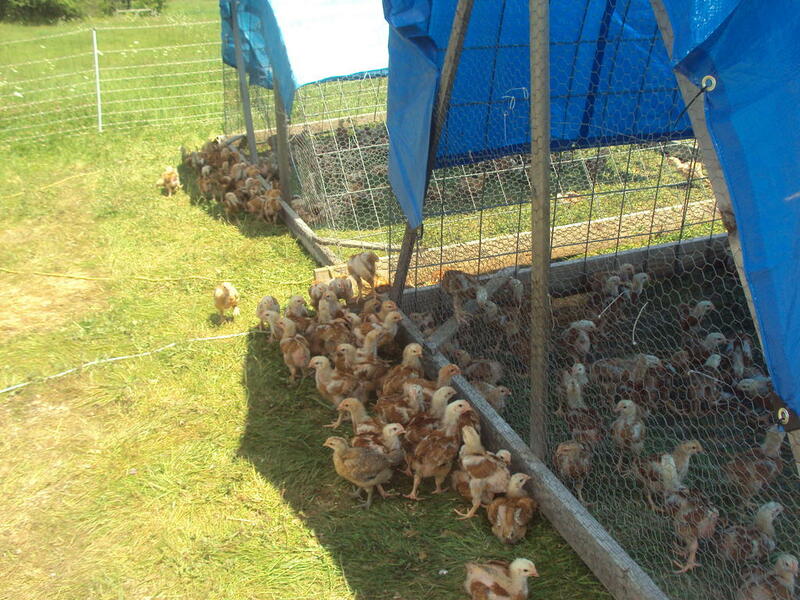 The 1,000 chickens and 100 pigs also are fed organic grains. The Sinisis have 30 cows. 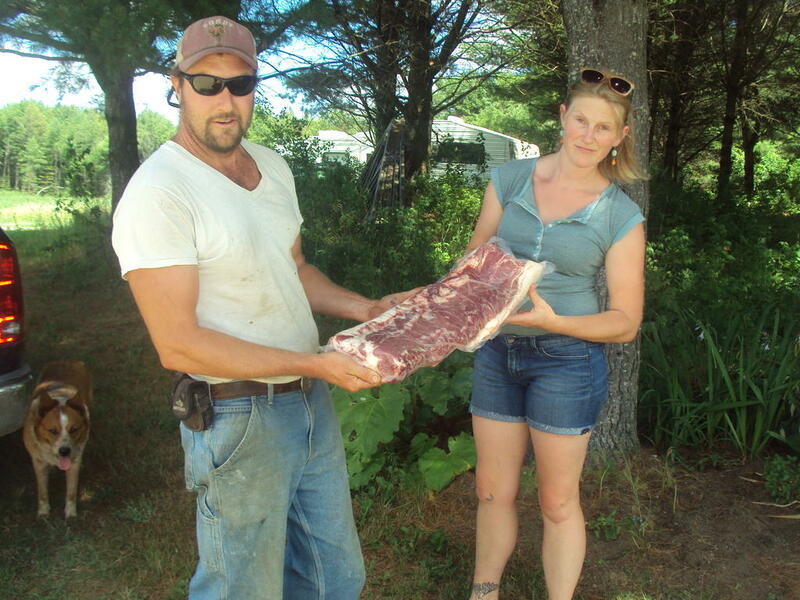 Seren Sinisi said that Old Crow Ranch meat is not certified organic by the Maine Organic Farmers and Growers Association, because the Sinisis differ with some of MOFGA’s practices, such as isolating animals that are on antibiotics to treat infections. 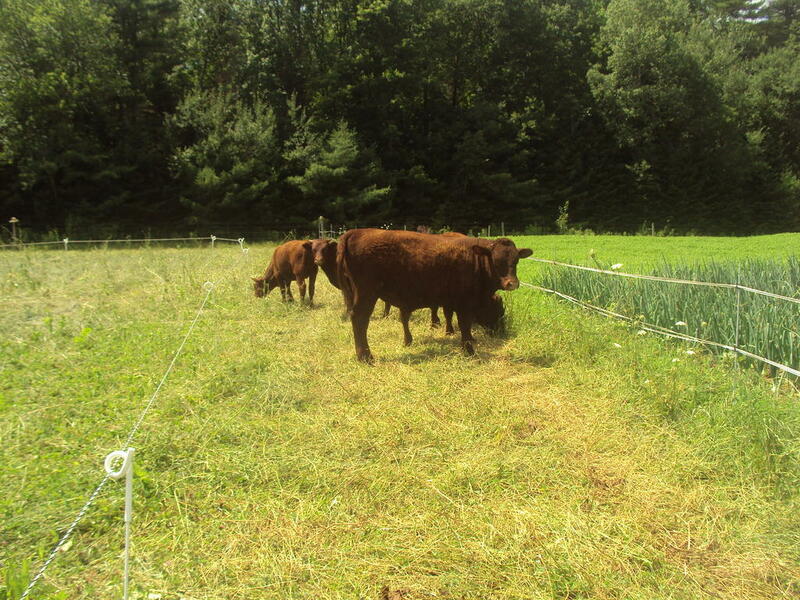 They purchased the farm eight years ago with help from the Land for Maine’s Future program, which led to an easement from Royal River Conservation Trust. If maintaining such an operation without outside help is a challenge, so, too, was the acquisition of the farm. Steve Sinisi came to Maine from Wisconsin in 1999 to work and volunteer with MOFGA in an apprenticeship program. He worked for a time at New Leaf Farm, just down the road. Seren Sinisi, a Union native, had earned a bachelor’s degree in theater from the University of Southern Maine. The couple met at the Fryeburg Fair, and married in 2013. They have a 15-year-old daughter, Magnolia, from his previous marriage, and a 2-year-old daughter, Vinka. He had purchased the property in 2008 through the agricultural easement, and in 2009 Old Crow Ranch was born. According to the easement, the property is protected as farmland exclusively. Steve Sinisi said he had contacted 14 banking institutions seeking a loan. The entrance to Old Crow Ranch is unimposing – a dirt road flanked on each side by fields. Closer to the homestead, there are big blue hoop tents, bales of hay in white tarps, and gardens. Old Crow Ranch sells two-thirds of its products to Farmer’s Gate Market, a butcher shop in Wales, and to Rosemont Market in Portland. The remainder is sold through the website, www.oldcrowranch.com. The Sinisis are experimenting with the raising of five Mangalitsa pigs, known for their high fat content that is ideal for the production of salami and prosciutto, a dry-cured ham. The mangalistas were the focal point of Old Crown Ranch’s hog slaughter, butcher and processing event, called the “Nose to Tail Workshop,” this past spring, which provided visitors with hands-on instruction of in the process. Three-week-old “freedom ranger” chickens, same as the other animals at Old Crow Ranch in Durham, have room to run around. It’s the pause that refreshes when Seren Sinisi hoses down the mangalitsa pigs on a hot day at Old Crow Ranch in Durham. Steve and Seren Sinisi hold up a pork loin, packaged and ready for market. Cows graze at Old Crow Ranch in Durham. 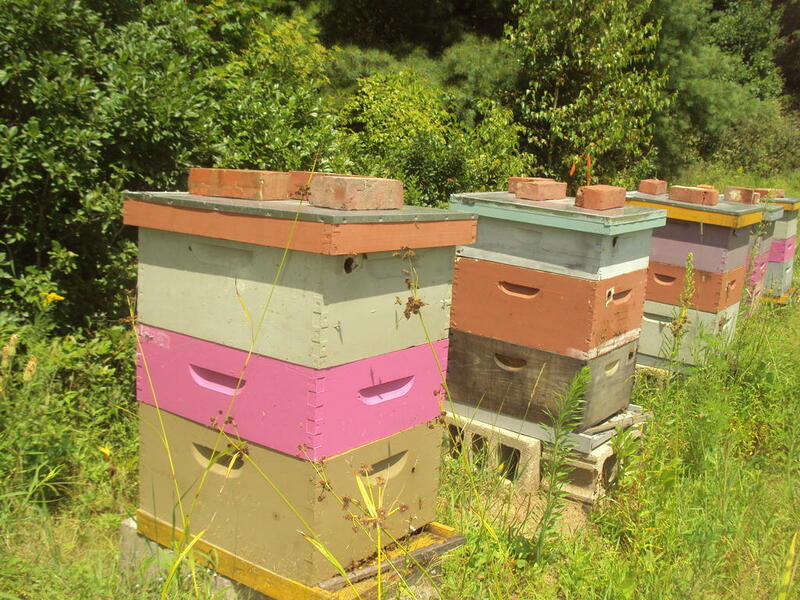 Bees buzz around their hives at Old Crown Ranch in Durham. 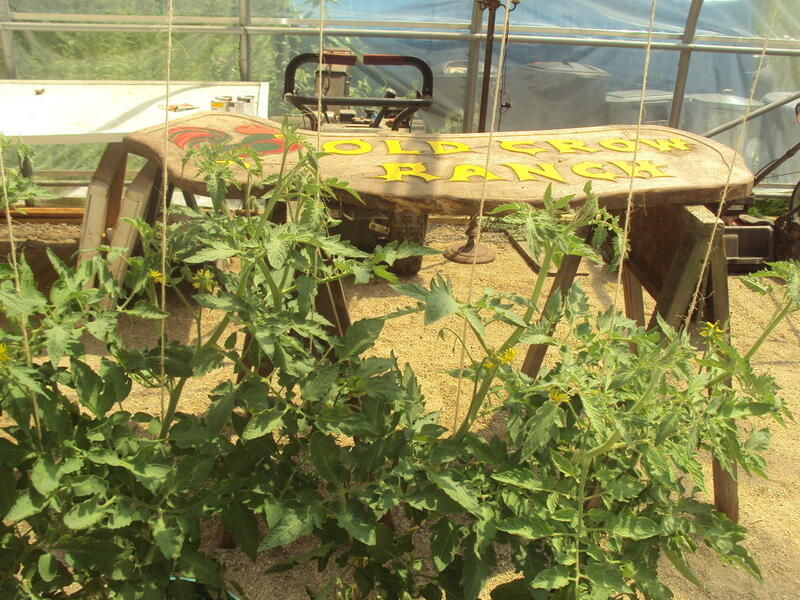 Tomatoes grow nicely in a shed, with a sign in the background, at Old Crow Ranch in Durham.